I get asked to make this more than anything else I cook. It has been called "stupid delicious", and there are BBQ food trucks that serve this as one of their customer's favorite side dishes. This recipe is for a ½ sized, steam table, food pan, 2 ½” deep. The pan will be very full, and will require the edges of the pan to be turned up. Double the ingredients for a full size food pan. Melt the butter in a large skillet over medium high heat. Once the butter is melted, add the onion and the 4 ounces of 505 you saved from the bottle, and add your favorite seasoning, to your taste (I use my own seasoning blend). Sweat the onions and chiles until the onions are just starting to become translucent, then add the Panko bread crumbs to the skillet. Keep stirring the Panko mixture in the pan until everything is mixed together completely, and the bread crumbs have turned a golden brown, being careful not to burn the mixture. Once done, remove from pan to cool. 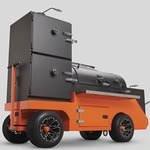 Preheat your Yoder smoker to 250 - 275 degrees. Turn up all sides of the ½ food pan to prevent spilling. Put the dry macaroni in the bottom of the pan. Evenly spread both cheeses over the top of the macaroni. Pour the milk, cream and the 8 ounces of the 505 chile puree into the pan. Season with your favorite spice(s) to your taste (I use my own seasoning blend). Stir everything in the pan together thoroughly. Put the pan on the smoker for about 2 to 2 ½ hours. Stir the contents in the pan thoroughly a couple of times, once at the 1 hour mark, and again just before you put on the bacon and Panko toppings. When the mixture just starts to bubble, it is time to put the bacon and Panko toppings on. After stirring the contents of the pan thoroughly, sprinkle the bacon evenly over the top of the mac & cheese and gently mix it into the mac & cheese. Now evenly distribute the Panko mixture over the top. After putting on the toppings, leave the pan on the smoker for an additional ½ hour. Remove from the cooker and let it sit for a few minutes to firm up, and enjoy. I know I've had this a while, I NEED to try this. It sounds sooooo good. I made this for the ATBBQ crew and I get asked every time they see me if I am going to make it again. Andy Groneman used it for one of his classes at ATBBQ as well. Made this for the 1st time last night. It was a HUGE hit. Spun off of the recipe just a little bit & used ground wild hog chorizo cooked crispy instead of the bacon. That's why this is obsession is so awesome, make recipes your own.